ALBANY – #bFair2DirectCare today publicly released a letter to Governor Cuomo, urging him to use his 30-day budget amendments to restore funding that will help direct care workers receive a living wage. The 2017-18 and 2018-19 budgets included the first two phases of a living wage funding plan, but the Governor did not include the next phases of this six-installment plan in his proposal for the coming fiscal year. “It is imperative that you understand that developmental disability service organizations who employ DSPs are experiencing significant financial stress, and some are on the brink of collapse,” the letter said. The full letter Governor Cuomo can be found below. 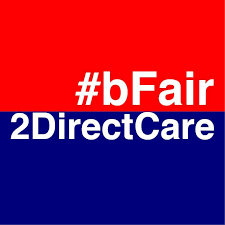 Direct support professionals (DSPs) in #bFair2DirectCare non-profits are 73 percent women and 55 percent black or Latino. They support persons with autism, Down syndrome, cerebral palsy and other developmental disabilities. Non-profits took over primary responsibility for this work, at the state’s behest, after the Willowbrook scandal of the 1970s, where residents were living in inhumane conditions in a state facility. Should non-profit agencies close, the responsibility for supporting people with developmental disabilities would fall back onto the State of New York. You can read more about Willowbrook here. DSPs are highly trained in a wide variety of critical areas that include administering medications, giving first aid and CPR, behavioral interventions, supporting independent living and ensuring the safety and opportunity of those they support. Yet, in many cases they are paid less than fast-food or big-box retail workers. #bFair2DirectCare is seeking roughly $75 million in funding, which amounts to about 0.05% of the Governor’s proposed $176 billion budget proposal. When fully implemented, the living wage for a DSP would be roughly $15.50/hour upstate and roughly $17.80/hour in New York City. The letter was released as The Arc New York and the New York Alliance for Inclusion and Innovation open their annual two-day Joint Legislative and Policy Forum. The two groups are leaders in the #bFair2DirectCare campaign. As a coalition of stakeholders in the field of developmental disabilities, representing service provider organizations, Direct Support Professionals (DSPs), people with developmental disabilities, and their family members, we write to respectfully request that you include funding for #bFair2DirectCare in the amendments to your 2019-20 Executive Budget Proposal. Two years ago, you stood before us in the War Room at the NYS Capitol and proclaimed your support for a living wage for DSPs who support people with developmental disabilities – pledging not to sign a budget unless it included this funding. We thank you for your support then, and the initial two investments you made in the six-year schedule to bring DSPs to a living wage. We request that you continue that commitment with amendments to your budget proposal for this year by including the next two investments in that living wage installment plan to take place on 4/1/19 and 1/1/20 for a total of $75M. It is imperative that you understand that developmental disability service organizations who employ DSPs are experiencing significant financial stress, and some are on the brink of collapse. Absent this type of investment, we face an all-but-certain scenario in which organizations currently providing these supports become insolvent, are no longer able to pay their staff, and close. Should that happen, supports for people with disabilities will become unavailable, and NYS risks failing in its constitutional obligation to support individuals with intellectual and developmental disabilities. As we have informed you previously, our system faces a workforce crisis, the likes of which has never before been seen in this field. The direct support workforce is the backbone of this system. Personnel costs for provider organizations consume nearly 75% of their budgets, with DSPs accounting for the greatest majority of spending on service delivery. Fewer and fewer people are willing to work as a DSP because the work has become noncompetitive with other jobs in the community as the minimum wage continues to rise. DSPs are not only low paid, but workloads are heavy, the work is highly demanding, and the responsibilities are grossly disproportionate to the compensation. In 2018, the direct support staff vacancy rate throughout the developmental disabilities field grew to an average 14.3% (with many individual provider organizations facing even more dire situations). Staff vacancies, in organizations that have state mandated minimum staffing requirements, forced provider organizations to pay more than 12 million hours of overtime to direct support staff in 2018, an increase of 17% over 2017. As a result, many direct support staff got burned-out and left their jobs. In turn, this resulted in provider organizations experiencing an average 26.4% direct support staff turnover rate. Thanks to you and the legislature, and your commitment to funding for wages in 2017, the vacancy and turnover rates have not grown, but have not decreased either. Organizations providing supports to people with developmental disabilities would raise wages on their own to make direct support jobs more competitive, but wages for direct support work are directly linked to the rates NYS pays to deliver supports. Unlike other sectors that have greater diversification of revenue, the vast majority of developmental disability service organizations receive 90% or more of their revenue from public dollars (mostly Medicaid). The developmental disabilities service system’s workforce crisis has generated a crisis in the quality of supports people with developmental disabilities rely upon. It should be expected that for most provider organizations, their workforce challenges will manifest as challenges to maintaining minimum quality requirements set by NYS. Some organizations are being forced to discontinue providing “loss leader” services, leaving a dearth of services in certain areas of the state. Other organizations will simply collapse after they are unable to meet payroll, or their authority to bill for providing supports is revoked due to quality issues caused by a lack of qualified direct support workers. We expect policy makers to blame the fiscal insolvency and violations of quality standards on poor management. However, the root of this pervasive, system-wide problem will be the inability to recruit and retain quality workers caused by inadequate funding. That point will become clear to all as more and more organizations struggle, and some succumb. Unlike in previous shifts of service capacity the state has managed, the field of developmental disability provider organizations is so eroded and weakened after years of minimal investments, that most providers are unable to absorb additional service capacity when provider organizations in their region become insolvent and cease operation. This should cause you significant alarm, as the situation will either require NYS to step in to provide services directly, or individuals with disabilities and their families will go without supports – some of which are life-sustaining. Nearly 85% of supports for New Yorkers with developmental disabilities are delivered through the network of community-based, not-for-profit organizations – some of which are the largest employers in their regions. Through this network, the State is able to fulfill its statutory responsibility to provide services to people with developmental disabilities. Without this network, the State would be responsible to provide these services directly – at about a 40% increase in cost. While efforts to “transform” developmental disability services and move into managed care are underway at a seemingly breakneck speed, we are concerned that community-based developmental disability service providers won’t be around to complete such a transition unless a commitment to a living wage for DSPs is realized. We believe this fate can be prevented, and supports for people with developmental disabilities can go uninterrupted, if you include an investment in this sector's workforce in your amended 2019-20 budget proposal. Again, we are requesting $75 million this year for the next two investments in our six-year living wage investment plan, following on your commitment two years ago to the first two installments. We hope you’ll continue your commitment and implement the next two phases. Without such funding, the health and safety of New Yorkers with intellectual and developmental disabilities is placed at further risk. We are already dangerously close to organization and system collapse now; failure to invest in this sector’s backbone – the DSP workforce – will make that a reality.